When Karen Allen puts her mind to something, she doesn’t turn back. That trait has proven useful in her life, from parenting, to learning how to ride a motorcycle, and to conquering a cancer diagnosis. The Wenatchee, Washington mother was working and raising a family when she received news in June of 2008 that she had cancer. Karen adopted a positive attitude from the beginning, telling people she wanted to “die living.” One way she started was to finally do what she’d been putting off for years: learn to ride. After purchasing the bike, Karen was unable to ride for several weeks. During that time, she said she lost confidence in her ability and was nervous to try again. 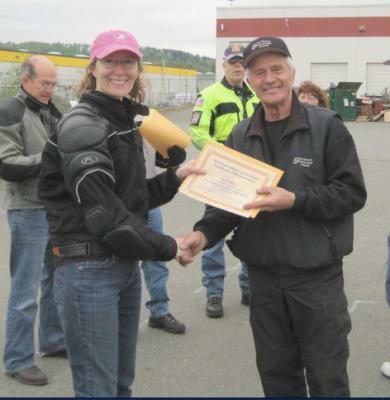 Thanks to the support of friends and her own determination, she got back in the saddle and signed up for a private lesson with the owner of Northwest Motorcycle School, Ed Melroy. 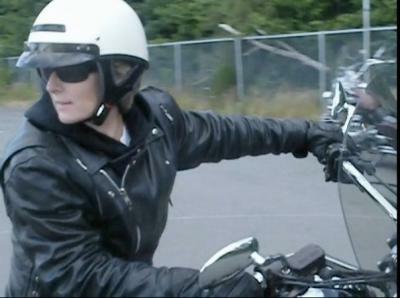 After their session, Karen decided to take his 40-hour "Ride Like a Cop" class to continue her skill improvement. The only thing more empowering is an example like Karen’s. What a wonderful and inspiring story.... It would be so wonderful to re tell this story in my paper, Motorcycle Mojo, and every other publication going - Karen - YOU - YOUR STORY - is the essence of what motorcycling is - God Bless you! Inspiring to say the least. Life IS short... you will ride well and ride a long time. Take care Karen! One of my fav pics of the Conga III is Biird telling Flo how the Conga and riding has put the living in her life. Makes me misty just thinking about it. Biird, you rock! Karen, you are an amazing women! I'm very thankful I got to meet when the Conga III stopped in Post Falls. You have inspired me and many other's. 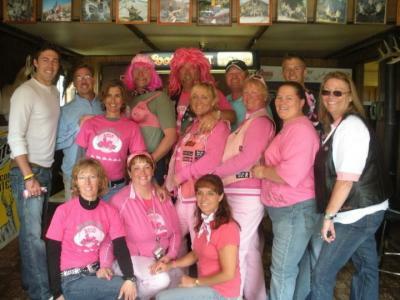 Hope to ride with the Conga IV next year! Be safe and God Bless you!